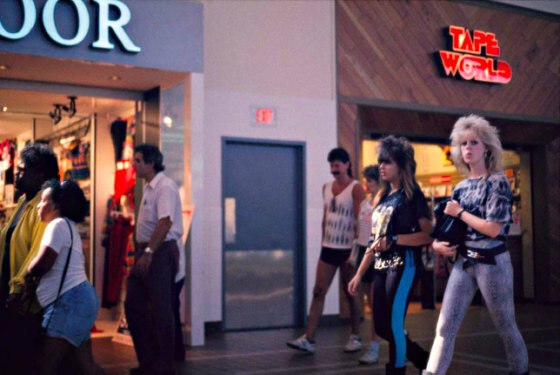 The 80's, especially its music (see below) were awesome. You know what? I'm just going to paste the Today.com page on this. Enjoy. 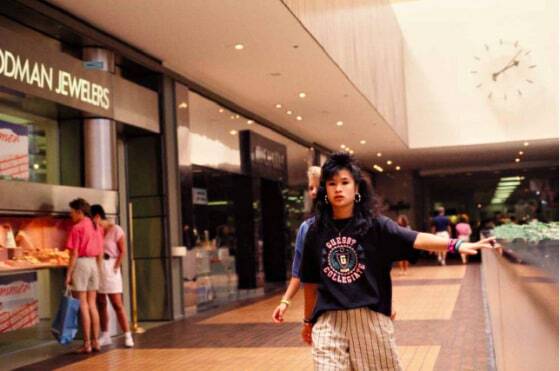 Galinsky captured this photo while on a road trip in 1989. 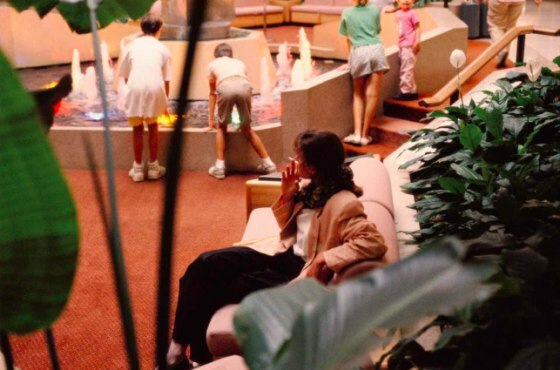 When filmmaker Michael Galinsky went looking in a desk drawer one day in 2010, he'd all but forgotten about a series of photographs he'd taken in malls across America back in 1989. What he found was a time capsule that has since carried people around the country on a wave of nostalgia, as they relive the 80's through his photos — even finding themselves or loved ones in his images. Galinsky, who shot the photos as a freshman at NYU, saw them go viral that year after posting them online, and was able to raise $13,000 on Kickstarter to publish the images as a book. 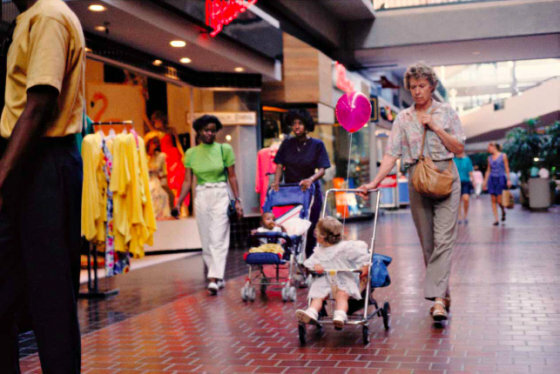 Released late last month, his book "Malls Across America" is already backlogged on Amazon, leading the photos to once again burn up the Internet. And in the process, something strange has happened that really shocked Galinsky: readers started to identify the people in the photos. Jamie Rutina, left, contact Galinsky after seeing this picture, and says it's of him. "So your gonna think this sounds crazy but im sooo sure that im the guy in picture 11 on the article," Jamie Rutina wrote in a message Galinsky shared with TODAY.com. "You cant see my face cuz im looking down at something, but I know its me, the hair is mine, the coat, the stance/mannerism. I was 20 yrs old then." 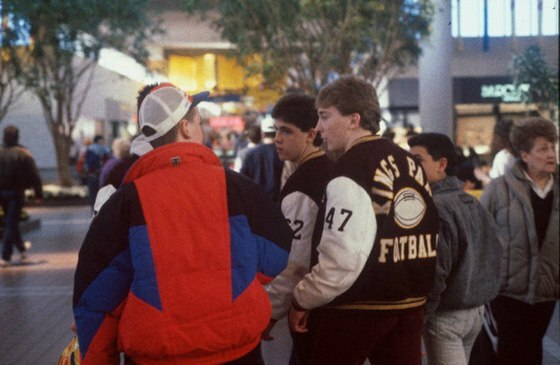 One man recognized the numbers on this jacket. “The 'jock' on the left is my uncle! Number 62,” wrote another fan, after spotting a picture posted on Facebook. David Walczak says this is a picture of his parents. Another man recognized his father in one of Galinsky’s photos, just hours after returning from his father’s memorial service. 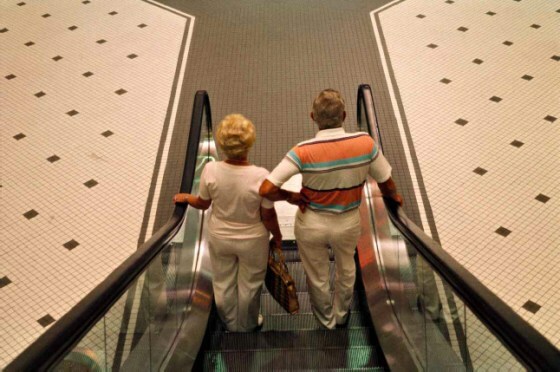 "That photo...is of my parents," David Walczak wrote, in an email Galinsky shared with TODAY.com, of a photo of a couple on an escalator. "I recognized them as soon as I saw it. The really shocking thing is we had my father’s memorial on November 7th, and visited his grave on the 8th...It really feels like my Father chose this vehicle to let my family know he is in a good place." “It’s really powerful to see yourself randomly in that way. 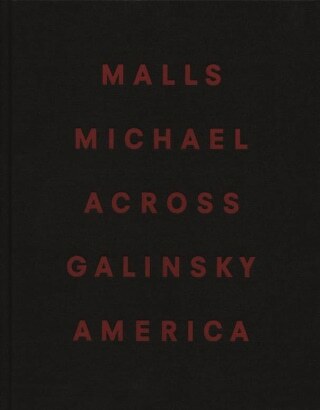 It’s shocking,” Galinsky says, of people who see themselves or people they know in his photos. 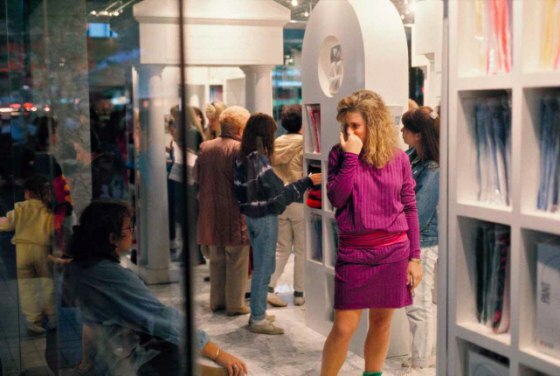 The project began when Galinsky happened upon a Long Island Mall with a college girlfriend and found inspiration for a color photography class project. “We walked in and I said, ‘This is the project.’ It was this vibrant, crazy, public space filled with interesting people, and colors, and light,” he remembers. 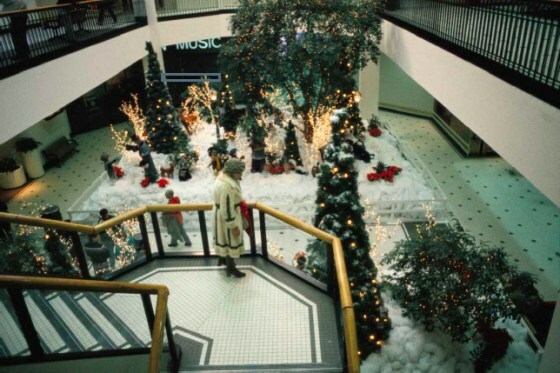 Later that year, with encouragement from his photography professor, Galinsky set out with a friend and his cheap Nikon FG-20 on a cross-country road trip and captured life in 15 different malls. 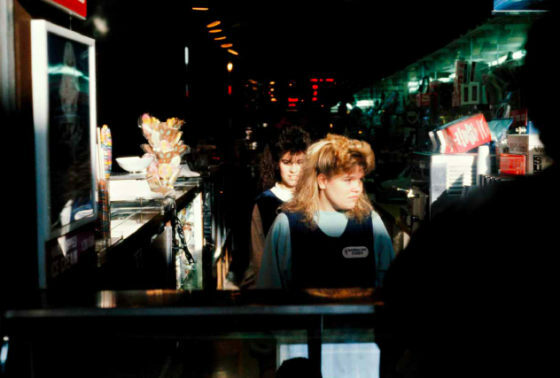 He shot covertly, without his subjects' knowledge, inspired by street photographers like Robert Frank and Garry Winogrand. Galinsky tried to exhibit the photos, but their amateur quality meant he only got one chance to display them—at a rock show—before they were lost to a box. He turned his focus to his band, Sleepyhead, and eventually his career as a documentary filmmaker. After they spread like wildfire, Galinsky says he stopped feeling ownership over the photos, and that they're now part of the Internet's DNA. 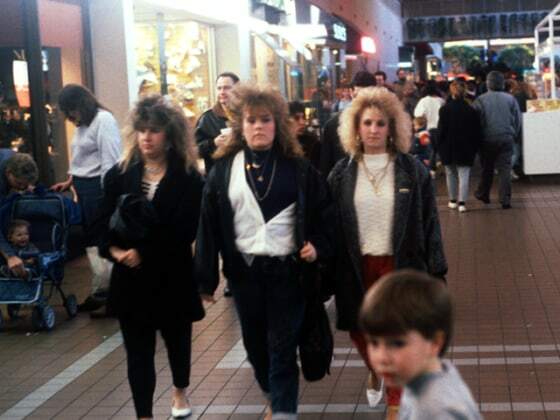 More than two decades ago, photographer Michael Galinsky captured the big hair, bad clothes and overall bodaciousness at malls around the country.